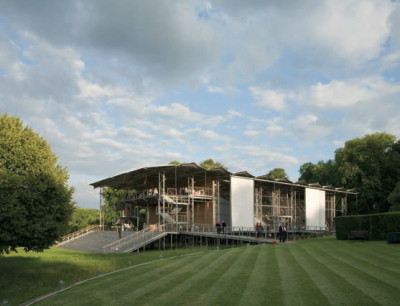 The new auditorium, which provides 600 seats and six wheelchair positions, occupies a commanding yet intimate and sheltered position within the Park at Wormsley. It is conceived as an elegant lightweight pavilion set within its parkland setting, elevated above the ground giving the appearance of 'floating' above the landscape. 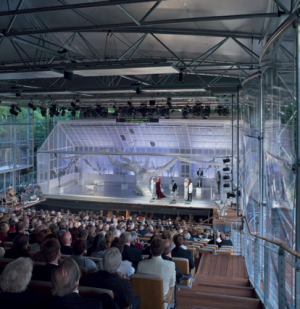 As the building is modular and entirely demountable, it is an extremely flexible structure which can be adjusted as required to suit the changing opera performances. The sliding screens’ track allows the outer line of the building envelope to be adjusted in a matter of minutes to reflect climatic conditions, and the design of the tracks allows for additional screens to be installed as required. The whole structure is conceived as a 'Rig for Opera'. The brief was for a theatre with full facilities, yet to be demountable annually. Techniques used in 'instant' open-air concert staging have been used and developed, with lightweight superstructure and heavier floor and terraces, all with ingenious membrane cladding.